NOTE: I thought I'd posted this long ago. Oh, well, better late than never. PHOTO CAPTIONS: 1. 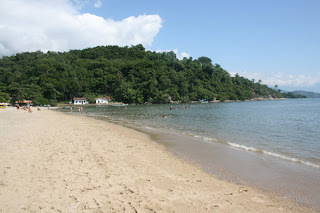 One of a dozen picturesque villages along the Costa Verde between Rio and Paraty, 2. Santa Rita church in Paraty, 3. bpats waiting to take tourists out to small islands and hidden beaches, 4. the beach closest to our hotel. Notice the thronging crowds, 5. Andre found some friends to play volleyball with, 6. 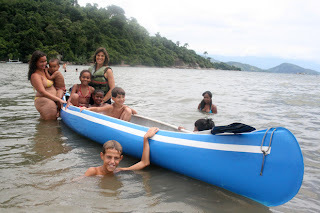 We rented a canoe and invited our friends to paddle around a bit after we went out to an island, 7. Our room at the Hotel Colonial, 8. Morning buffet at the hotel, 9. 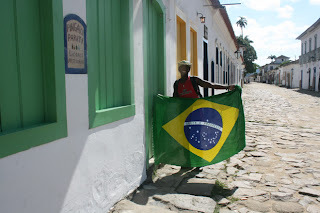 Andre in the colonial zone showing off my sarong of the Brazilian flag, 10. One of many beautiful doorways, 11. View from the hilltop cemetery, 12. Andre at the night market, 13. a tourist poses for her caricature. Sometimes you get lucky. You read about a place in a guidebook, decide to give it a chance, and when you get there it’s even better than you imagined. 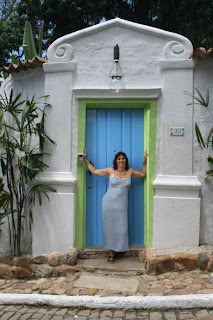 Paraty (pronounced para-CHEE in Portuguese) was one of those wonderful surprises. I never carry a guidebook myself. The latest edition of Lonely Plantet’s South American Handbook is over 700 pages and with my MacBook and two cameras, I’m already overloaded. But I’m not too proud to borrow a copy and then, which I did at our hostel in Rio. 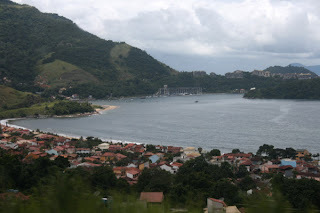 I wanted to find a nice, quiet place along the Costa Verde on our way to Sao Paulo airport. 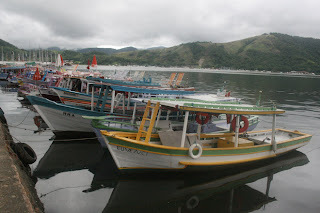 The guidebook described Paraty as a historic fishing village of 33,000. Its preservation had happened naturally due to isolation. 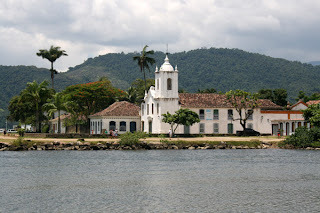 Before the road to Rio was built in the 1970s, Paraty was only accessible by boat. The guidebook also warned that the hotels are fully booked between Christmas and Carnival. When the first place I called had a room available and was only a 10-minute walk from the bus station, we headed right over. 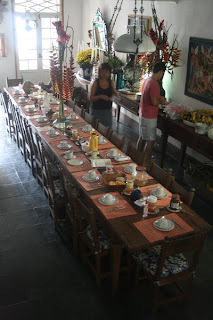 The Casa de Colonial was perfect, a nice combo of historic charm with modern convenience. Their buffet breakfast ranks right up there with the best: fresh papaya, mango and melon, fresh-squeezed pineapple, mango, melon and orange juices, coffee, tea, hot chocolate, two kinds of ham and homemade cheese, five different marmalades, honey, French rolls straight from the baker, and hot scrambled eggs. I loved walking the cobble-stoned, car-free historic area, especially at night when the weather cooled a bit -- except it made me miss Maya even more. She would have loved the freedom to gallivant around, taking in the street entertainment, watching portrait artists, jugglers, and human statues, buying coconut sweets and handcrafts, and playing with other tourist kids. And the beaches, wow! The closest beach, 5 minute walk from our hotel, was actually our favorite. Again, I thought of Maya since the water was clear and warm, without waves, and you could walk out forever and it still was only waist-deep. Maya would have been frolicking with the other kids. Every morning a large group of local kids participated in a life-saving class, just like Little Guards in Santa Cruz. Women participated in dance aerobix classes on the beach, and samba drummers performed every night, which we could hear from our room as we drifted off to sleep. You can hire a boat and driver for $30 an hour for up to 10 passengers. We chose to rent a canoe instead and had fun paddling around the little islands, giving a ride to some of our little friends for a bit. 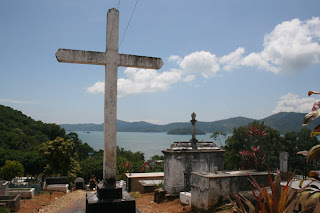 I hiked up the hill to the cemetery, which incidentally, has a best view of the tiled rooftops, bay and islands. Andre’s not much into cemeteries, but he accompanied me to the old fort, protected by ancient cannons and a few stray dogs. Along the way we passed charming “pousadas” perched on the hillside, with swimming pools and outdoor dining and a bird’s eye view of everything. They made our Casa de Colonial look ordinary in comparison. 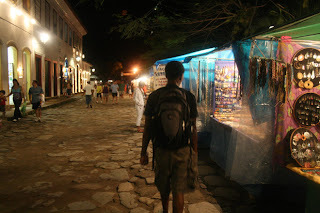 The only disadvantage of Paraty for me was the lack of wi-fi. 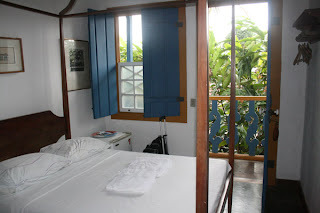 After trying to connect unsuccessfully in several internet cafes, I was directed to Pousada do Sandi (rooms from $200-$300 a night). A very nice clerk explained that normally the wi-fi is for hotel guests only, but he gave me the password anyway and invited me into the dining room where I could work comfortably.